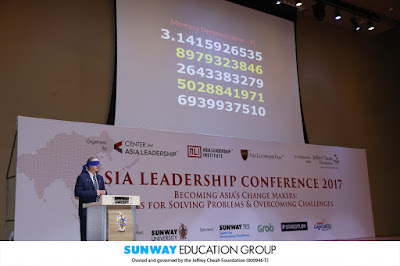 “The global education system today is far too focused on standardised text. This approach is great at creating individuals who are intelligent, but has yet to create the kind that helps the society progress in meaningful ways. This text reveals nothing of their common sense or wisdom despite the fact that these qualities are enormously important in making the world a better place.” This was one of the points made by Shameena Gill of SMK(P) Methodist, Ipoh who took home the champion trophy at the Oxford and Cambridge Society Malaysia 15th English Language Event: Public Speaking Competition 2017 at Sunway College. 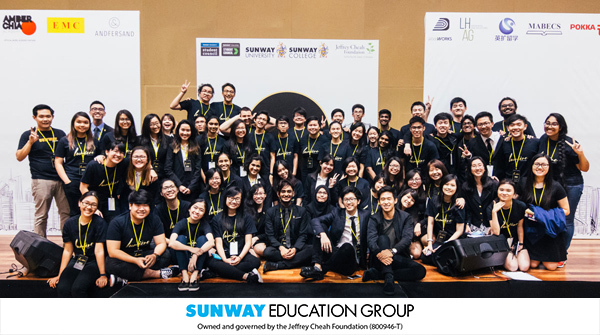 Over one weekend, 23 students displayed their innovative products and services at the 3rd Nurturing Business Champions (NBC) competition, hosted by Sunway TES Centre for Accountancy Excellence (CAE), Sunway College. The champions, Jack Ng Wei Lun, Low Sindy, Jessica Ngan Keh Jinn and Tey Hsien Chyi of Team Vib! took home RM8,000 cash prize. The team of four developed and presented a new product named “Vib!”, an electronic device which uses vibration detection and sonar technology to transform any hard surface into a smart interface (touch screen). Team DIA took home second runner-up. From left: Ng Zhi Qian, Goh Zhou Sheann, Melaine Mok Zi Qing, Teo Ee Sing, Nurin Syahirah Ishma bt Osman, and Ng Han Qi. 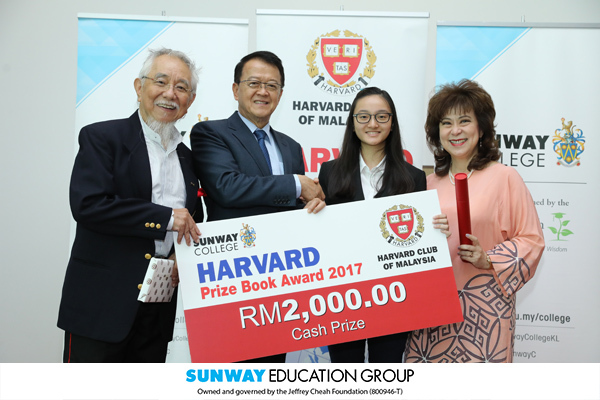 Lee Marsha from Sri Desa Learning Centre Sdn Bhd, emerged champion with her speech titled “Self Image” in the Sunway Australian Matriculation (AUSMAT) Pitch Competition 2017, winning herself a bursary of RM16,000 to pursue the AUSMAT programme at Sunway College. 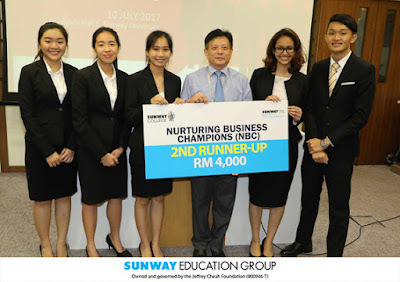 Woo Yi Mun from Pusat Tuisyen Akademi Johan, who spoke on “Jury vs Judge” came in 1st Runner-up. 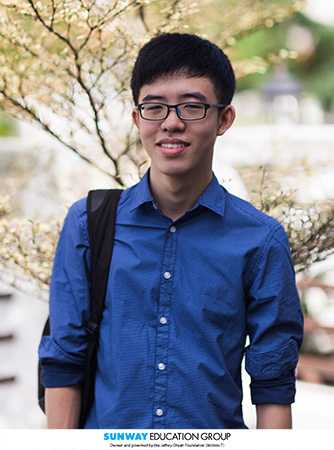 Yi Mun won a RM12,000 bursary to pursue the AUSMAT programme. 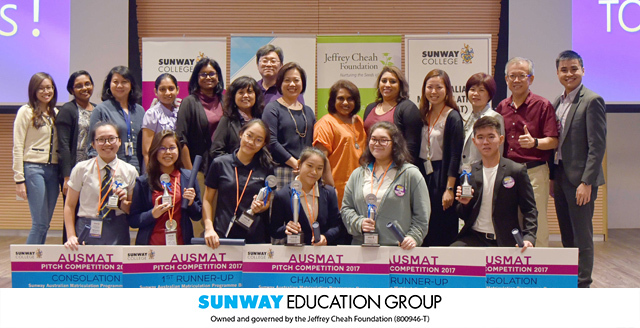 Winners of the Sunway AUSMAT Pitch Competition 2017 with their teachers and judges of the competition, Vanitha (standing, 5th from left), Cheng Mien Wee (standing, 7th from left) and Alagarani. (Front row, L-R): Alexandria Goh Hui Yi, Jolene Tan Hui Ling, Woo Yi Mun, Lee Marsha, Judith Elise Gomes and Marcus Chai Zhen Yang. Hundreds of excited and proud Sunwayians gathered to welcome back our heroes & to honour their outstanding achievements at the SEA GAMES 2017. 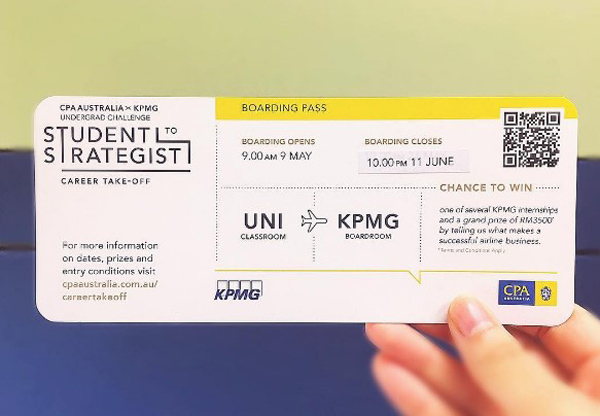 Three outstanding students from the Victoria University Undergraduate Programme, Cheah Luey Teng, Avelynn Michael and Poong Chun Leong participated in the CPA Australia x KPMG Undergrad Challenge Competition on 17 July 2017. Having successfully passed the first two rounds of challenges, this dynamic trio gained valuable experiences preparing and presenting to a board of professional judges from CPA Australia and KPMG Malaysia in their final round. 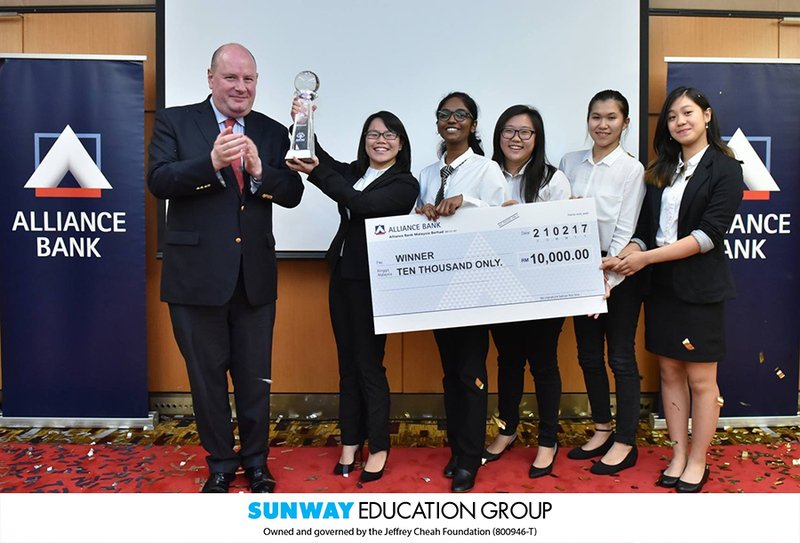 Their impressive presentation won them the consolation prize and an internship with KPMG. 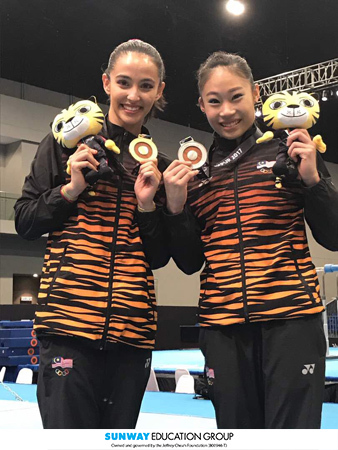 CIMP is proud of its two alumni who represented Malaysia at the SEA Games this September. Gymnasts Farah Ann Binti Abdul Hadi and Tang Ing Yueh both graduated from CIMP and were part of the gold medal-winning team at the SEA Games. Farah also won gold with her individual floor routine, nailing the final tricky pass. Ing Yueh also took home the gold medal on the vault and silver on the balance beam. CIMP students topped the nominations for the 2017 Harvard Prize Book Award with 7 of the 15 finalists. 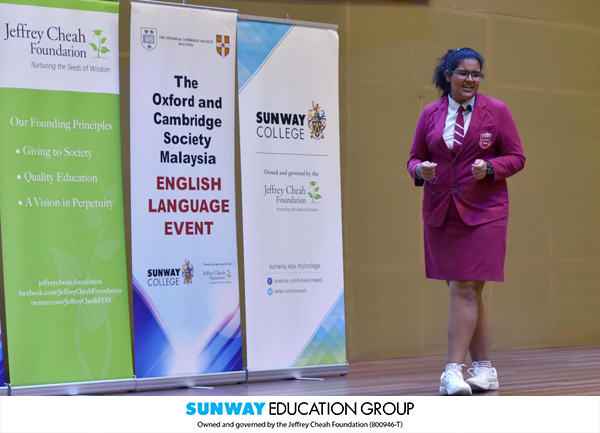 In the end of the 4 winners, two came from CIMP and another representing the Canadian Programme from Sunway International School. Loo Foong Ann and Lee Shirley were thrilled to represent CIMP and Edmund Chung Sim Wea was selected from SIS. 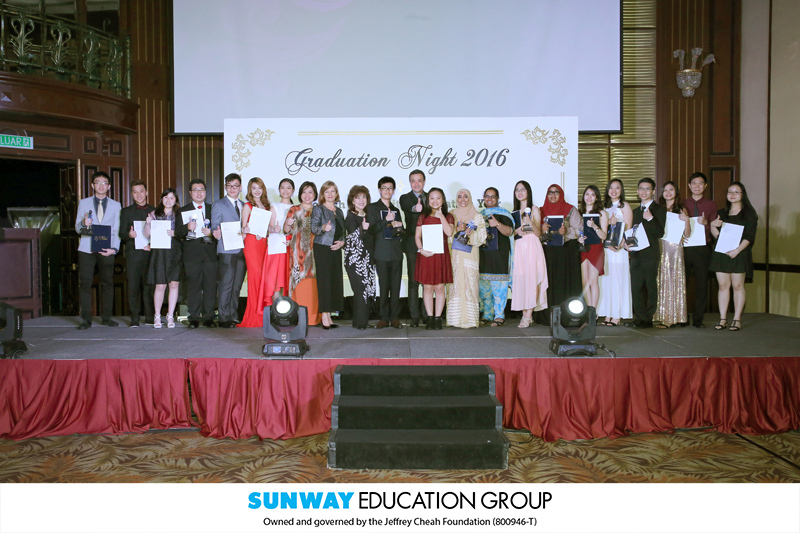 Each winner took home an RM2000 cash prize. 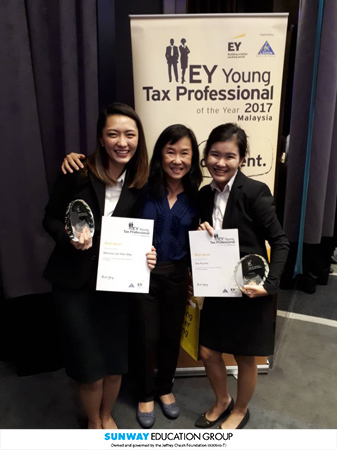 Congratulations to EY YTPY 2017 National Champion Marissa Lee Sher May! Sunway TES is proud to announce the two students who have been the cream of the crop in the EY Young Tax Professional of the Year 2017 competition held on the 7th September 2017. We would like to wish our heartiest congratulations Marissa Lee Sher May as she prevailed to be the champion for the National finals of YTPY 2017. Coming in as second runner-up of the National finals was Yee Pui Kei. From left: National Champion Marissa Lee Sher May, STES Lecturer Kok Fong Hun, 2nd Runner-up Yee Pui Kei. 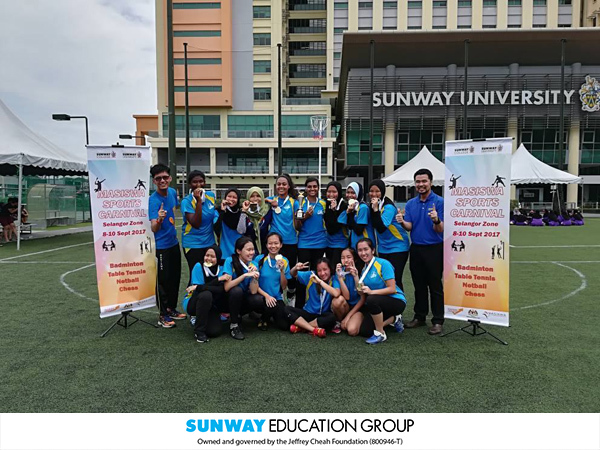 It was the very first time Sunway University selected as the host for the MASISWA Sports Carnival Selangor Zone Championship. It was like a dream came true for Sunway Sports Team to be given the opportunity and chance as an ideal opportunity for the us to promote our facilities within the campus and around Bandar Sunway. 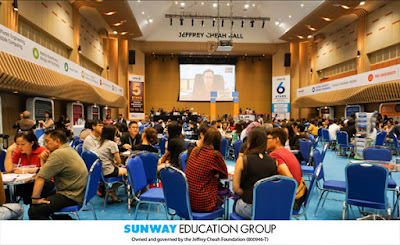 4 sports contested (Table Tennis, Badminton, Netball and Chess) during the three days event. The medals handed out, and the record books closed. 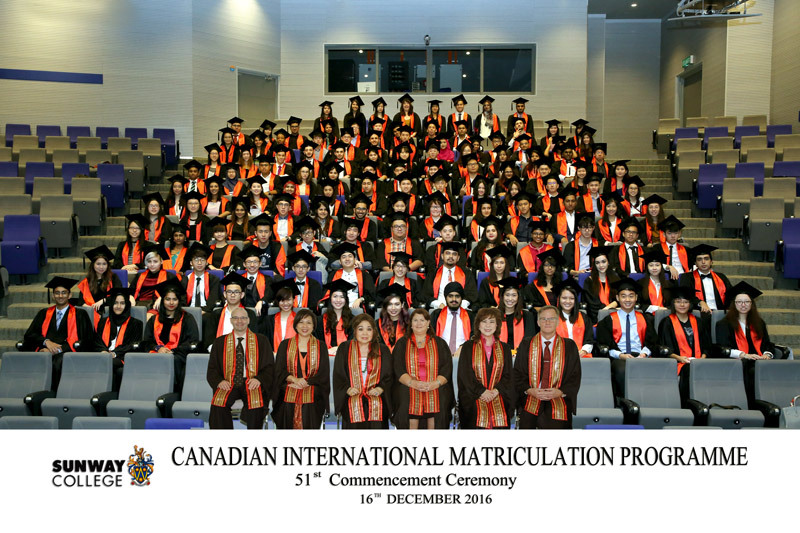 A total of 21 institutions took part for this year. 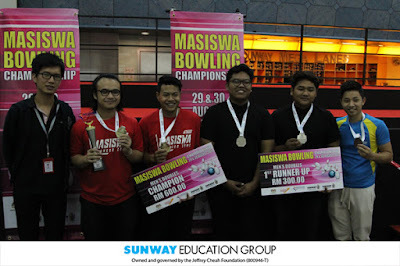 Majlis Sukan IPTS Malaysia (MASISWA) Bowling Championship 2017 was held on the 29th – 30th August at Sunway Mega Lanes. The event started with Singles event and ended with Doubles event over the two days event. It was another huge honour for Sunway Sports Team to be given another opportunity to host the prestigious event once again this year. 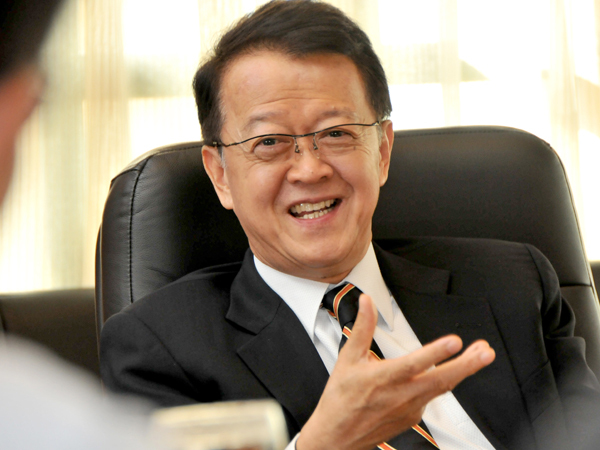 Malaysia is known for its many faceted diversities. 16th of September mark the day that Malaysia was formed and the Sekretariat Rukun Negara Sunway took the opportunity to celebrate it. The event was filled with cultural performances and a mini traditional exhibition that allowed us to preserve the cultural traditions. VU @ Sunway had once again organised another outstanding Talk on the 18th August 2017 entitled “Introduction to Fintech – Part 1”, organised by Dr Benedict Valentine Arulanandam. 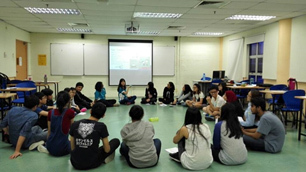 A total of 56 students enrolled for this event. The talk included: Overview of Fintech, Governance and Financial Regulations, Branding and Marketing of Fintech and the future of banking technologies. Students were interactive and appreciated the insightful knowledge of Fintech. This is the second Teaching & Learning related event organised by the Teaching & Learning committee of VU Undergraduate Programme. 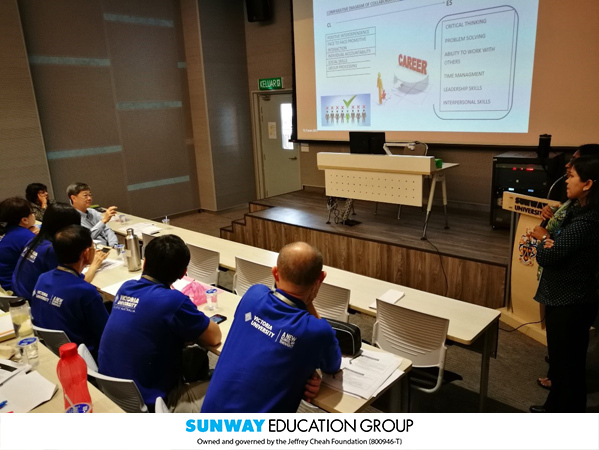 This seminar was held on 7 September at LT5, New University Building at Sunway University. The T&L seminar is a showcase of research work from VUUP staff. The aim of the seminar is to foster a stronger research culture within the department and to encourage research projects and related initiatives among the staff. Congratulations to the Top 4 Winners of Harvard Prize Book Awards! 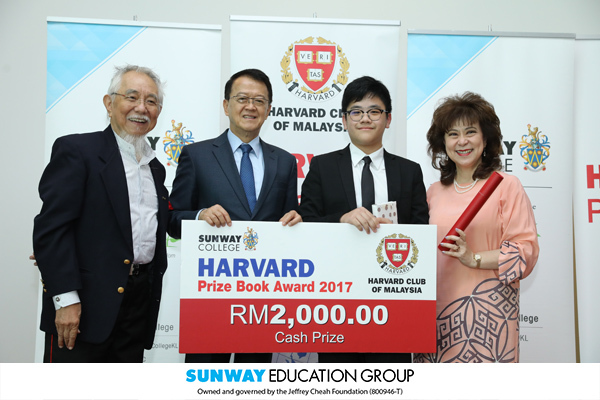 The Harvard Club of Malaysia collaborates with Sunway College held a ceremony to celebrates the Top 4 winners of the Harvard Prize Book Award. Lee Shirley (CIMP), Loo Foong Ann (CIMP), Chong Zhen Yuen (A Level), and Edmund Chung Sim Wea (SIS), They each received RM 2,000 cash prize, a copy of the Harvard Prize Book, a certificate endorsed by the Harvard Club of Malaysia and an internship opportunity with the Harvard Club of Malaysia. 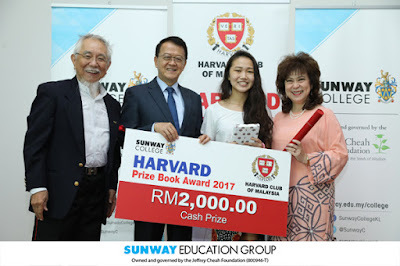 This has been the seven-year collaboration between Harvard Club of Malaysia and Sunway College. Since 1910, Harvard University has been awarding Harvard Prize Book Award to outstanding students worldwide in recognition to their academic achievement and demonstrate exceptional contribution in community service. 7 students and 4 alumni from Sunway University represented Team Malaysia in the 29th SEA Games 2017 which also branded as Kuala Lumpur 2017. Taking part in the five sports of artistic gymnastics, ice hockey, swimming, bowling and ice skating - the athletes came away with an impressive medal tally of 7 Gold, 3 Silver and 3 Bronze. The games were an amazing experience for all our athletes. They are all winners at the games. Sunway recently celebrated the Teaching Appreciation Day themed “Our Passion. The Future.” to commemorate the dedication of our lecturers who have guided many students along the way, contributing to their successful careers. 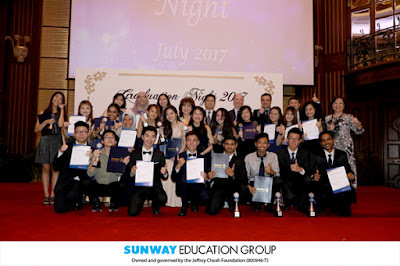 Among the highlights of the event were the Student Appreciation of Teaching awards, Sunway International School Most Promising New Teacher award, Pre-U Most Promising New Lecturer award and the Award for Excellence in Teaching. The Sunway Education Open Day held on 8 & 9 July was an excellent platform for students & parents who wanted to know more about certain courses/programmes prior to enrolment, or wanted to check out the campus and facilities. Lecturers and academic staff were on hand to provide information and advice, while current students shared their experiences with prospective students. Dreams of experiencing the life as a scholar in Cambridge and Oxford University came true for eight students of Sunway College. 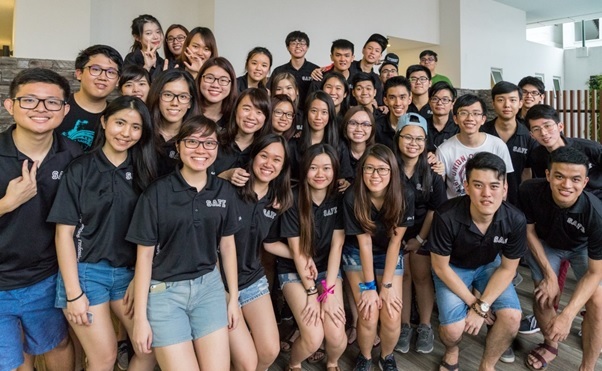 Seven A Level students, namely, Ezekiel Chow, Fong Fang Te. Laura Yew, Lee Li Zhu, Tan Vee Shuen, Max Leong Yu Shuen Ben Ang Zi Qi and Karen Kok May May from Ausmat Programme under the leadership of Ruth Cheah left Sunway Campus on the 12th of July to catch the late night flight to London. 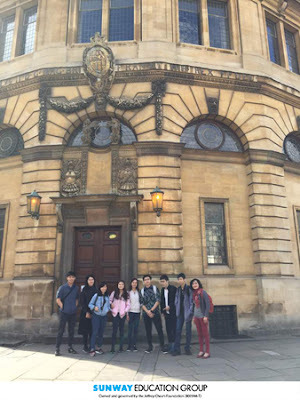 They had the privilege and opportunity to live and study in the Cambridge University college for 10 days from the 13th July to 22nd July including 3 days in Oxford. 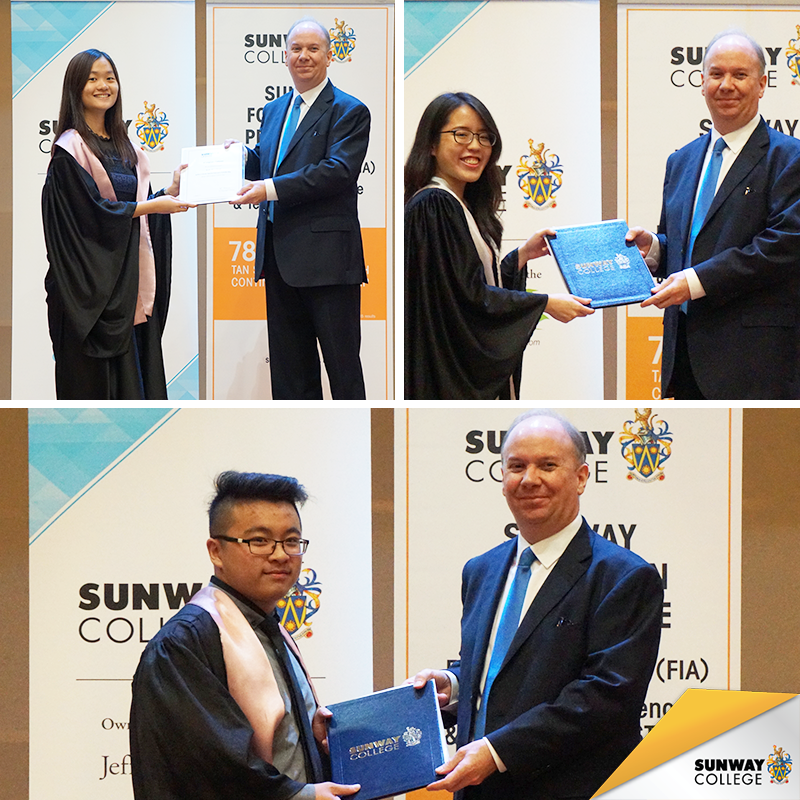 MUFY students at Sunway College Kuala Lumpur chalked up another impressive performance in the July 2017 examinations by winning 17 out of 22 Subject awards. MUFY Subject Awards are presented to students who achieve the highest score among all providers of MUFY worldwide in their respective subjects. 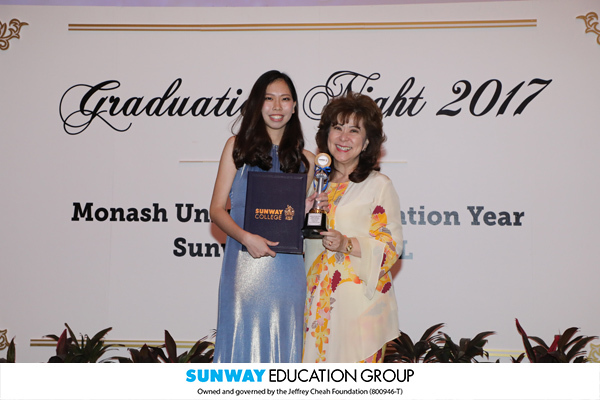 Jasmine Chiam Wan Ern received the MUFY Excellence Award for achieving an outstanding average score of 97.25%. 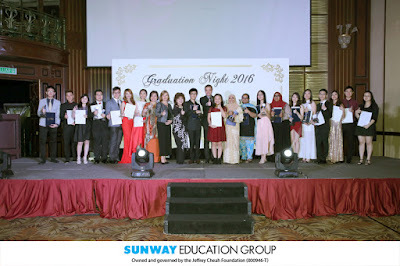 28 students received the Monash University High Achiever Award for achieving an average score of 89% and above. 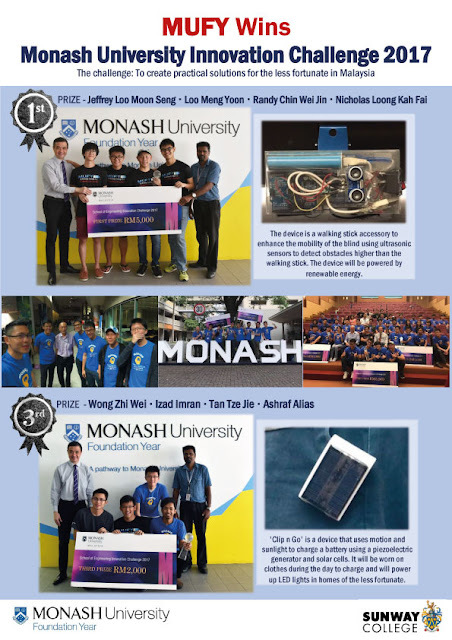 115 students achieved an average High Distinction score of at least 80% to be eligible for Monash University scholarship awards. 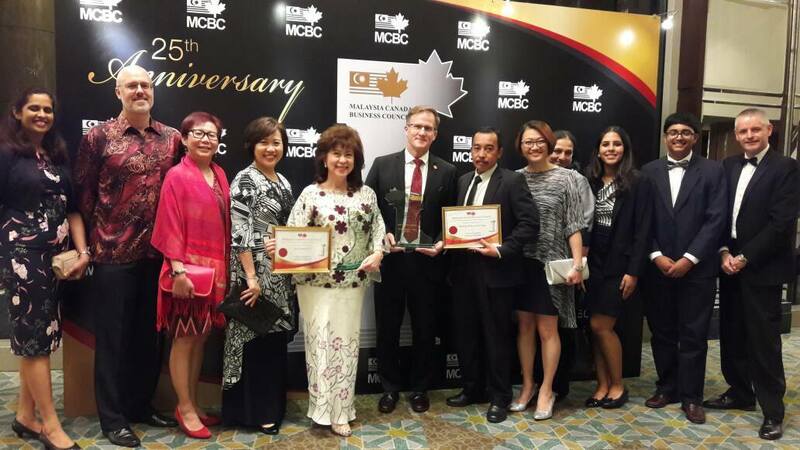 Recently, Dr. Elizabeth Lee, Senior Executive Director of Sunway Education Group was awarded the 'Woman Entrepreneur in Canadian Education' by the Malaysian Canadian Business Council (MCBC). 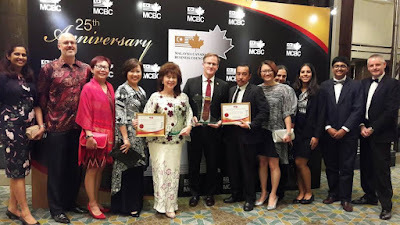 MCBC has been connecting Malaysian and Canadian companies for over 25 years. 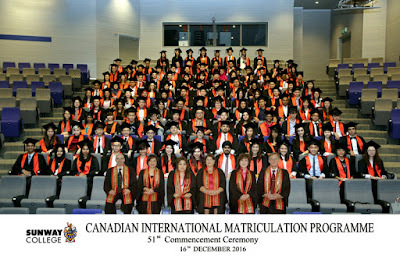 Building long-lasting relationships and creating a strong community of people the Canadian way. 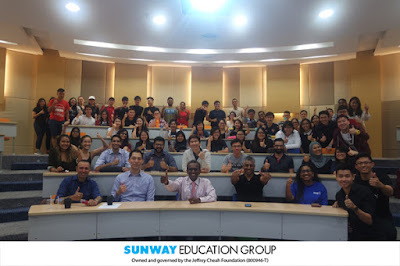 41 VUBB undergraduates visited Nestlé Malaysia on 22 May 2017 led by Dr Benedict V. Arulanandam and Ms A. Alagarani. They were briefed on the various operational aspects by a diverse management team. Our students also had the opportunity to mingle with the Interns and Management Trainees. The visit proved to be an eye opener for our students and feedback received from them are very encouraging. The Center for Asia Leadership (CAL), an initiative in collaboration with the Jeffrey Cheah Foundation, launched three books, namely Next Generation Leadership: Empowering Youth to Shape the Future of Asia, Leaders in Development: Enhancing Your Leadership Effectiveness in a Changing World and Rethinking Asia 3: Political and Social Change on May 3, 2017 at Sunway University. 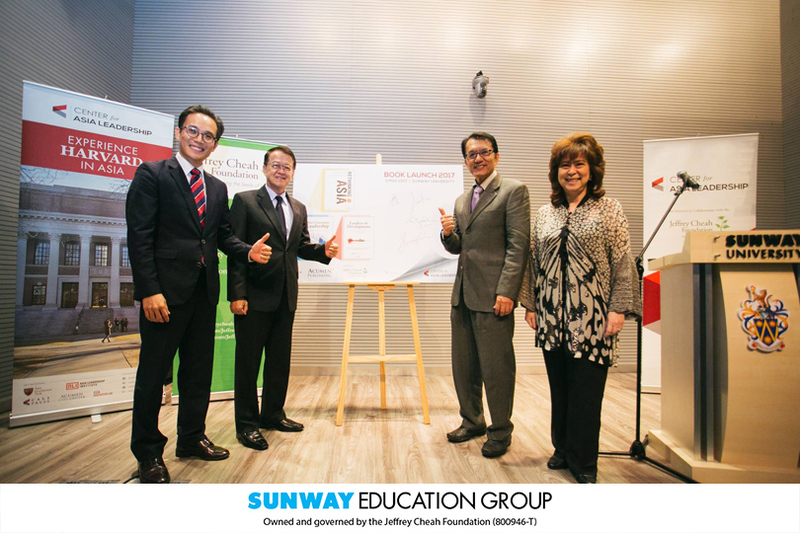 (left to right) Samuel Kim, President and Co-founder of Center fro Asia Leadership; Tan Sri Dr. Jeffrey Cheah, AO, Founding Trustee of the Jeffrey Cheah Foundation, and Chairman and Founder of Sunway Group; Dr. Lee Weng Keng, CEO of Sunway Education and Healthcare Divisions; and Dr. Elizabeth Lee, Senior Executive Director of Sunway Education Group and Sunway University giving the thumbs up following the signing ceremony on the poster board to mark the official launch of the books. 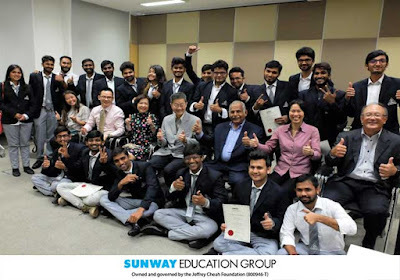 We have had the pleasure of hosting a group of 22 postgraduate visiting students from Acharya Bangalore Business School for a 4-Week Global Immersion Programme, from 18th April to 13th May, on Sunway campus. 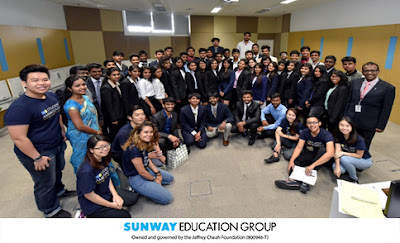 The GIP programme was organized by Sunway International Business & Management (SIBM), in collaboration with Acharya Bangalore Business School (ABBS) and VU Postgraduate Programme at Sunway. 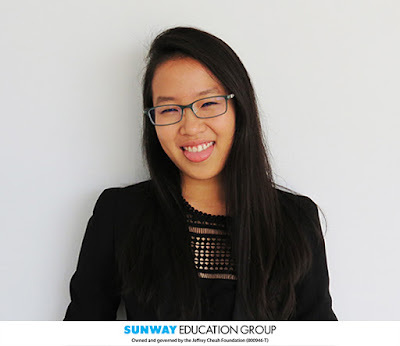 “MUFY and Sunway as a whole gave me an unbelievable array of opportunities, along with the supported freedom to pursue them to the best of my abilities. Throughout all 6 schools I’ve been to, including public, private, and international schools, I’ve seen Sunway prioritise the merit of their students the most, not just for me but for all the many hardworking and capable students I’ve met as well”, said Michelle Lee who completed the Monash University Foundation Year (MUFY) programme at Sunway College last year. 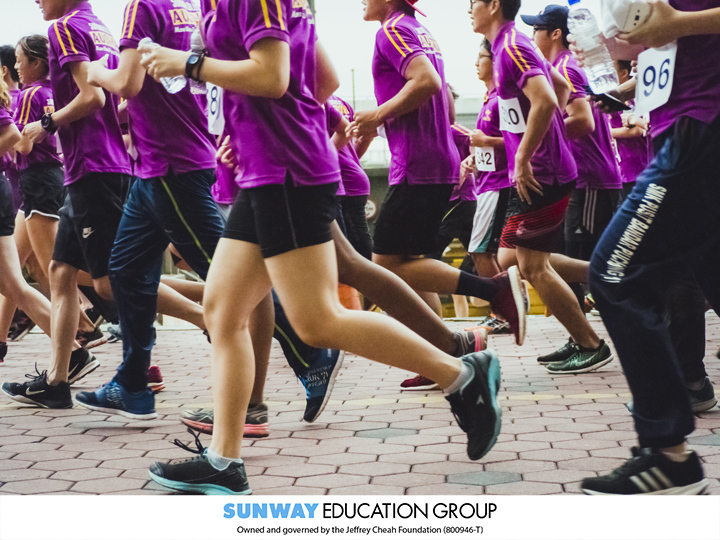 This year, AUSMAT Sunway organised its first ever charity run in commemoration of its 30 years of excellence in Sunway College. More than 600 AUSMAT students participated as runners as well as served as volunteers in various areas such as first aid, photography, route marshal, registration and bazaar style booth sales. All profits raised from this event will be donated to Yayasan Generasi Gemilang, a foundation which aims to improve the lives of under-served children and families by increasing access to quality education. The funds will be channelled to its current Community Centre located in Taman Prima Selayang, to cater for children who wants a more conducive learning environment to study. Sunway-Oxbridge Essay Competition is back for the fourth year running and will start receiving essays from 1-30 April 2017! 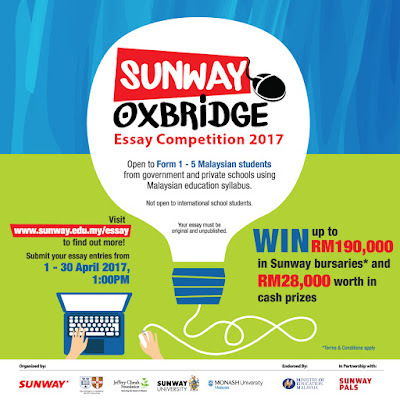 The competition is open to all secondary school students using the Malaysian syllabus, so start cracking because there are Sunway College bursaries and cash prizes to be won! 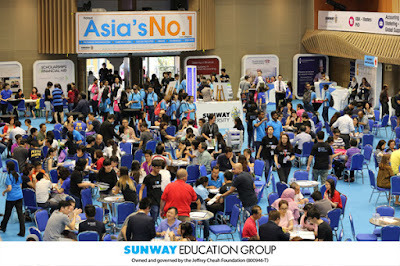 Visit www.sunway.edu.my/essay for more info. 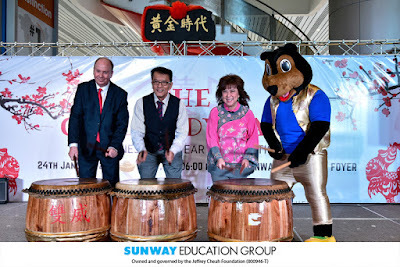 In-conjunction with the Lunar New Year, the Chinese Independent School Alumni Club (CISA) of Sunway University welcomed the Year of Rooster with a day of celebration. 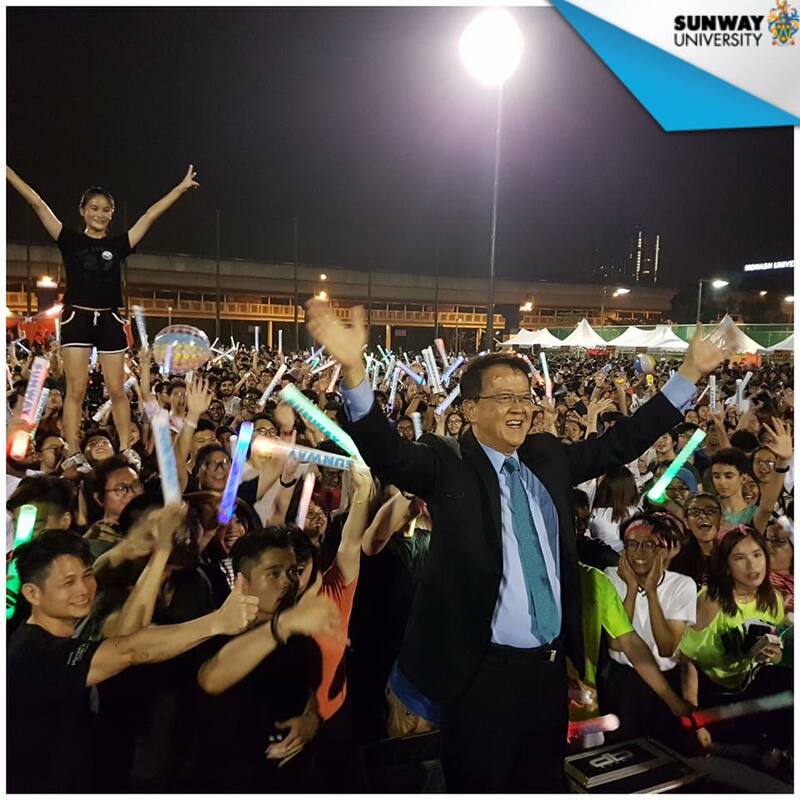 The celebration started off with a flash mob, followed by a 24 Festive Drum and Lion Dance performances. The festive celebration was officiated by Dr Lee Weng Keng, Chief Executive Officer, Education and Healthcare Division, Sunway Group; Dr Elizabeth Lee, Senior Executive Director of the Sunway Education Group and Sunway University and Professor Graeme Wilkinson, Vice-Chancellor of Sunway University. Congratulations to our alumni Ang Ker Soon and Chai Lai Kuan for winning the top honours in DHL Singapore recently. 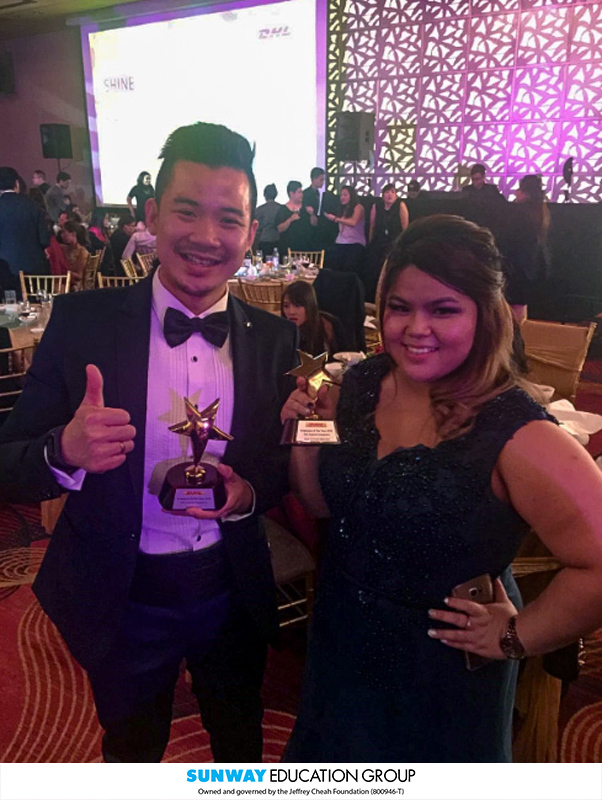 With over 1,000 employees in DHL Singapore, Ker Soon is one of the winners for the Employee of the Year 2016; while his VU Sunway junior, Lai Kuan, won the Outstanding Sales Person 2016 award for the second consecutive year. Close to 1,000 high school, college and university students from all over Malaysia attended the Asia Leadership Conference (ALC) 2017 which was held on January 14, 2017 at Sunway University. The one-day conference was organised by the Asia Leadership Trek and the Sunway Education Group, overseen by the Center for Asia Leadership and the Asia Leadership Institute, and supported by the Jeffrey Cheah Foundation. Our heartiest congratulations to Emeritus Professor Wang Gungwu, CBE for being the FIRST to be awarded the Doctor of Letters Honoris Cause by the premier Sunway University, in recognition of his distinction as one of the pre-eminent historians of Southeast Asia, for his outstanding services as a distinguished scholar and university administrator, and for his contribution to the development of higher education in Malaysia as an advisor and trustee of the Jeffrey Cheah Foundation. 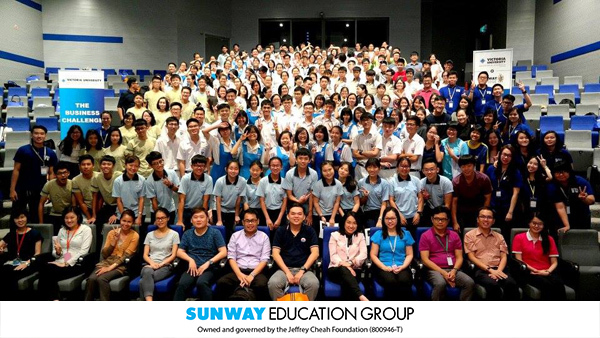 The IT Services Department at Sunway College takes going green seriously. 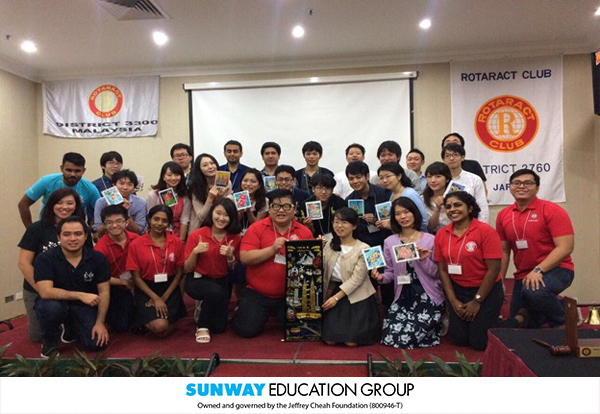 Annually together with the Safety and Health Department, and Facilities Department, the IT Services Department carries out an e-Waste Disposal Campaign where unwanted electronic gadgets such as mobile phones, batteries, chargers, and other electronic components belonging to staff and students are disposed via e-Waste collection bins placed in strategic locations throughout the Sunway campus. The collected e-Waste is then properly disposed. 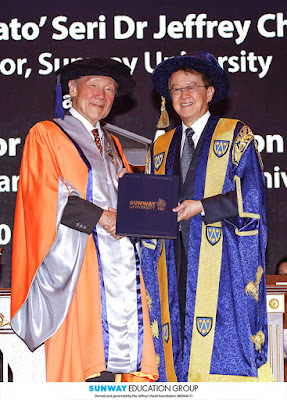 VU is family – were the words of Ling Chee Siong, a VU alumni, as he took in the atmosphere and reflected on being home again after 12 years. 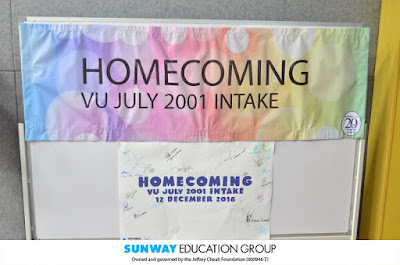 It was a day of celebration on the 12th of December 2016 for VU Sunway as we welcomed 42 alumni, class of July 2001, including their spouses and children, to once again visit their alma mater and recollect treasured memories of their undergraduate years. 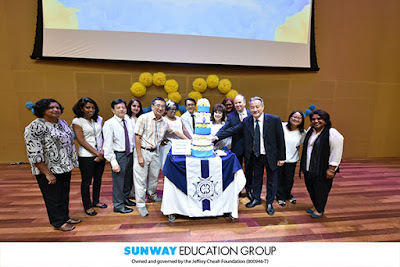 The event was made more remarkable with the gracious presence of Dr Elizabeth Lee, Senior Executive Director of Sunway Education Group, as the Guest-of-Honour, Ms Greeja De Silva, Director of Programme and Ms Irene Teoh, Deputy Director of Programme, alongside senior lecturers who have taught this cohort. 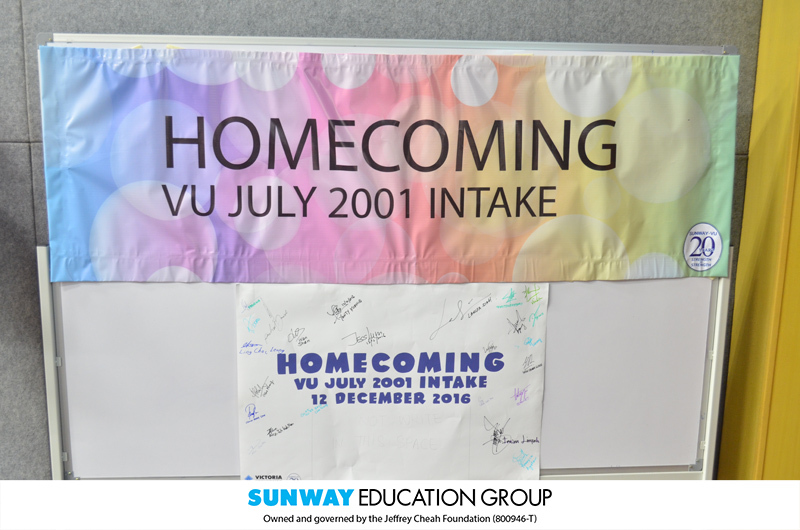 The festive occasion saw the homecoming of the once-students as they met their classmates and lecturers with open arms and warm greetings.